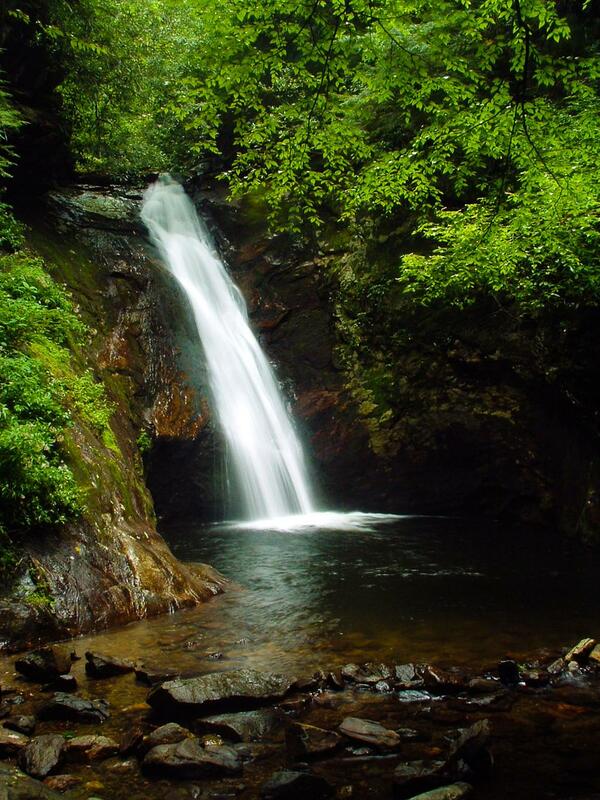 Courthouse Falls is a beautiful waterfall in a beautiful setting. It flows over a neat, scooped-out rock into a deep, dark, churning pool. It's almost like an enormous pothole. The little cove is lush and wet. The pool is popular for swimming, but beware of the dangerous undercurrents which swirl around down there, especially right at the base of the falls during high water. It's a long drive from anywhere, but put it on the list if you're in the area. From the intersection of US Hwy. 64 and NC Hwy. 215 in Rosman (at Headwaters Outfitters), take 215 North for about 10 1/4 miles and turn right on gravel FS 140. Or, from the intersection of the Blue Ridge Parkway and NC Hwy. 215, drive South on 215 for about 6 1/2 miles and make a left onto FS 140 (just past the bridge). Follow FS 140 about 3 miles to a bridge over Courthouse Creek. Park in the wide area on the right at the Summey Cove trailhead (the trail ison the left). The road is gated just ahead. FS 140 has sometimes been in bad condition but at other times easily accessible to passenger cars. Some work has been done on it recently (after the floods of 2004) so hopefully it's smooth. The hike is easy overall, but with a few rougher spots where it gets rocky. Go down the Summey Cove trail along Courthouse Creek for just under a quarter mile. Pass the top of the falls, and take the signed side path about 350 ft. to the base of the falls.